It was an anointed song delivered in many tongues: “Sin’s power over me is broken/When Jesus went I went/When Jesus rose I rose/Sin’s power over me is broken,” the simple but powerful lyrics proclaimed. As The SCOAN Choir and the congregation made that declaration, God’s Spirit descended into The Arena of Liberty and yokes of years yielded to the anointing, in the mighty name of Jesus. And what better way for Prophet T.B. Joshua to begin his message than by requesting an encore – a repeat of the anointed song! The man of God explained the meaning of the lyrics: For sin to lose its power over us is for us to cut off satan’s route to bringing tribulation, affliction, shame, sickness, stagnation and setback into our lives. As such, he advised the church to meditate always on the lyrics, from the bottom of their hearts. Seized by the spirit of song, the man of God again invited the church to sing along with him: “Inner my heart. Inner my heart. Inner my heart. My heart. Lord, I want to be like Jesus inner my heart.” On that note, he read from Matthew 11:28 and urged worshipers to have genuine faith in God since nothing else pleases the Creator more. 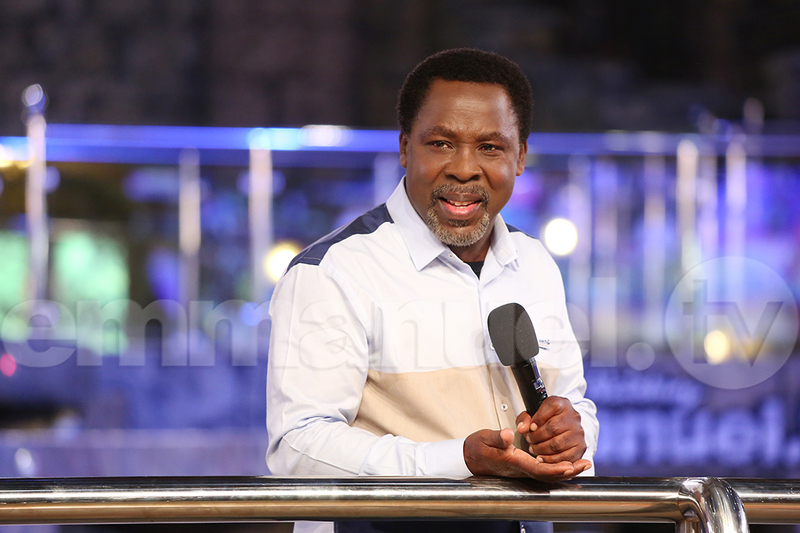 He also spoke on the need for us to identify and acknowledge our weakness, describing it as “victory itself.” In his final comments before prayers, the man of God admonished congregants not to hide their weakness, because doing so allows satan to take away their blessings. Next up was the message: HOW TO OVERCOME NEGATIVE THOUGHTS, preached by Chris. Taking his reading from Matthew 9:1-8. He noted that negative thoughts would often show up in our hearts but we have a duty to repel them and speak positivity into our situation. Arguing that “the battles on the outside are simply an extension of the battles on the inside,” Chris admonished the church to avoid entertaining thoughts from satan, the enemy of our soul. If we avoid feeding our negative thoughts, he added, they will not translate into words and actions that portray us as true Christians but as people putting on a camouflage. Pushing home his point, Chris stated “harbouring negative thoughts is like holding a bomb” that we must quickly drop before it explodes. Furthermore, Chris described reality as truth and asserted that “there is no reality outside of Christ.” He also reminded the congregation to cast their burdens on Jesus and leave vengeance to Him since God Himself is our Judge. To sum up his message, he cited the story of Joseph who, in Genesis 50:20, forgave his treacherous brothers while assuring them that their supposed evil actions had in fact been God’s way of leading him to his destiny as a man of substance and influence in a foreign land. 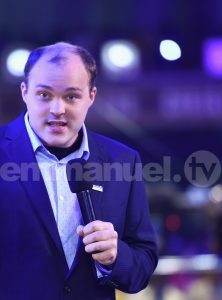 Surely, it was a Spirit-filled day at The Arena of Liberty as many received deliverance, healing and breakthrough in the all-conquering name of Jesus Christ. Below are the faith-building testimonies shared during the service. It was 28 years ago when Barrister Godwin Igwe first noticed the symptoms of what later turned out to be lumbar spondylosis. In effect, this meant he had a permanent ache in his lower back, which in turn meant he could not walk without using a lumbar corset. Needless to say, his work suffered since he lacked the capacity to stand or write for the long periods required of a practising lawyer. This meant that for half of the 56-year-old’s life, he had been under the yoke of pain. “I believe, having come here, the Lord will deliver me today,” he spoke in faith before the woman of God prayed for him. 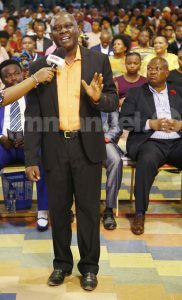 Testifying excitedly in church on Sunday, Barrister Igwe said he felt “like a heavy load left my back.” To prove his healing, he coughed voluntarily and exercised his limbs by taking brisk paces and jumping on the aisle – things he could not do before. He advised people to see Jesus as the solution to their problems. FASHION DESIGNER WALKS AGAIN WITHOUT CRUTCHES AND KNEE BRACE! Mrs Ogechi Irechukwu, a 36-year-old Nigerian from Imo State, had come to The SCOAN in crutches and a knee brace because she had septic arthritis and tendon strain. One morning she had woken up to a swollen knee and since then had found it difficult to do her work as a fashion designer or care properly for her children. Finding no lasting medical solution, Mrs Irechukwu cast her burden upon Jesus. At The Arena of Liberty, the woman of God prayed for her in Jesus’ mighty name. Seconds later, Mrs Irechukwu stood up and walked without her crutches and brace. Indeed, she was so overwhelmed by the miracle that she shed tears of joy as she thanked the Lord who created her. “God, You are great!” she cried as she knelt down in gratitude. 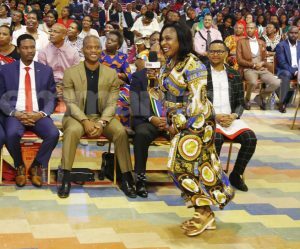 Testifying in church with her husband, Mrs Irechukwu showed that her joy knew no bounds as she ‘cat-walked’ and danced in front of the cameras. The couple advised people to have total trust in God. Mrs Koudiratou Taiwo had sciatica and a torn knee ligament, so, to help the 46-year-old nurse move a bit, the doctors gave her a lumbar corset and a knee brace. In pain and unable to do her work for the past one year, Mrs Taiwo petitioned God for her healing. “Be free in the name of Jesus!” the woman of God prayed as she lay hands on the nurse from France. 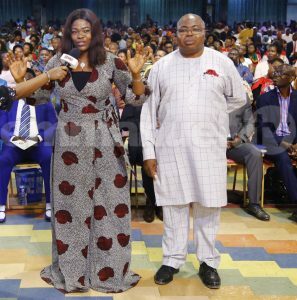 During her testimony, Mrs Taiwo said that after the prayer she had a dream in which her body was covered in mud up to the neck before a hand came down from Heaven and took her out. Since then, she said, she has been fully healed and delivered. She squatted and ran on the aisle to prove her healing. 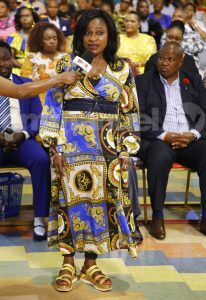 She advised people, especially those from the Francophone world, to take advantage of the anointing at The SCOAN. Regarding Prophet T.B. 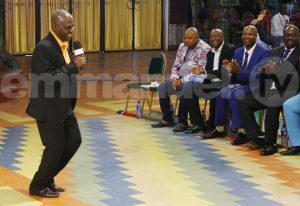 Joshua’s revelation that God had instructed him to close the overflow canopies and limit the number of people attending The SCOAN Sunday Service, 50-year-old senior police officer ASP Sunday Samuel received a vision from God, as confirmation. In the dream, the man of God had addressed church members. As the members were about to disperse, ASP Samuel said, they found that a cut tree was used to barricade the entrance while a vehicle reinforced the barricade from behind. What was left were just two tiny spaces on the left and right for people to pass through. Moreover, heavily armed security took charge of access control. Wondering why willing worshipers had to be shut out from God’s blessings, ASP Samuel confronted the officers, demanding an explanation. “We have been sent here because of bad people,” they told him. Apologising for not being happy about the man of God’s revelation earlier to remove the overflow canopies, ASP Samuel urged people to obey the voice of God always for our own good. In conclusion, as Prophet T.B. 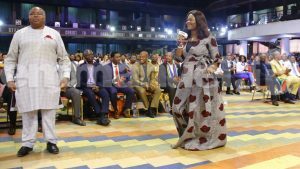 Joshua has repeatedly said, the strength of The SCOAN ministry is not in large membership but in the presence of God’s Spirit at The Arena of Liberty. May the Lord bless His Word in the midst of our heart. Amen.